Meet Dr. Michael Weitz, husband, father of three, emergency physician and a ten year lung cancer survivor. Michael’s remarkable story is one of hope, perseverance, courage and a testament to the promise of recent developments in lung cancer research. Michael looks at his lung cancer as a disease to be managed. Each new discovery becomes his bridge to an even brighter future. Michael knows his lung cancer is ALK-positive. This allows him access to certain targeted therapies developed to treat that particular biomarker. He was lucky – and he listened to his mother! – and he had his tumor tested for its genetic biomarkers. If you’ve been diagnosed with lung cancer, talk to your doctor about getting your tissue tested. It’s critical. Learn more about how to get your lung cancer tumor tested. Sign up to receive a brochure on biomarker testing, targeted therapies and immunotherapies to take to your doctor. ALK, or anaplastic lymphoma kinase, accounts for about 4% of lung cancer patients. ALK inhibitors can work very, very effectively in that subset of patients, where their tumors are driven by ALK. 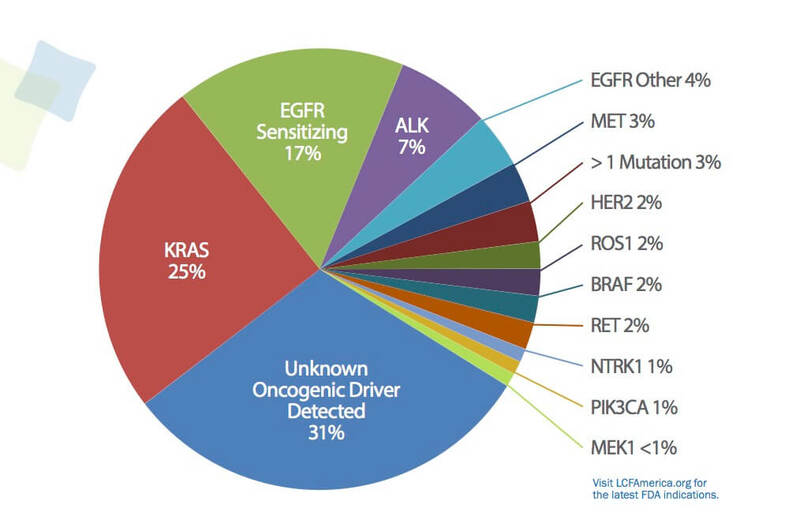 What other biomarkers have been identified? In addition to ALK, other biomarkers have been identified and some treatments that “target” these biomarkers have been approved or are currently in clinical trial. Learn more about Targeted Therapy for lung cancer.